December 5, 2013 at 2:53 pm Add a comment! The week before Thanksgiving, we had the ceilings re-done. 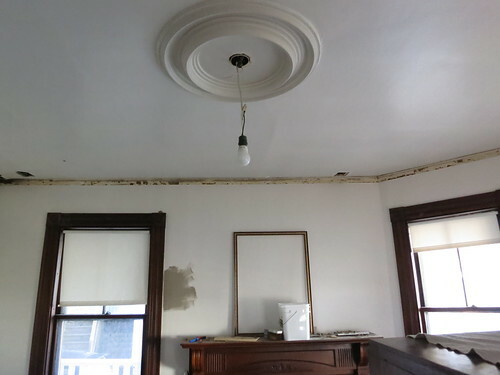 The standard way to repair plaster and Lath ceilings is to go over them with 3/8 inch blue-board and a coat of plaster. 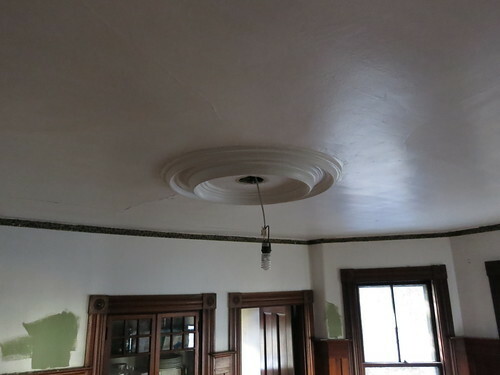 You can’t plaster right over them because of a very common early paint product called Calcimine paint that dries powdery white but will eventually release from the ceiling. The ceilings on the first floor weren’t terrible. 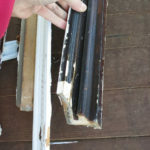 They didn’t have the peeling that is characteristic of Calcimine paint failure that we had in the den but they had been patched a myriad of times and were generally a bit rough. You can see in the entry the variety of plaster textures. 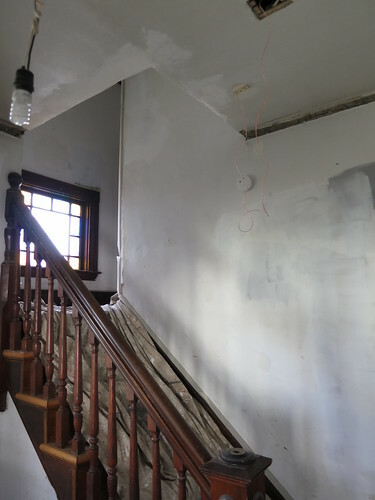 Once we decided on re-doing the ceilings, we took the liberty of cutting a bunch of holes to run electric in the Den which runs above the Entry and Piano rooms. In the Dining room, there was a large, sagging patch that needed to come down and be re-done but by just blue-boarding over it, we solved the problem by ignoring it. I’m afraid you can’t really tell by the pictures but the crack and un-even-ness give you an idea of what we were trying to avoid. The piano room is very similar though this picture masks it’s flaws. Before they came, I decided to cover all my wood trim and paneling. 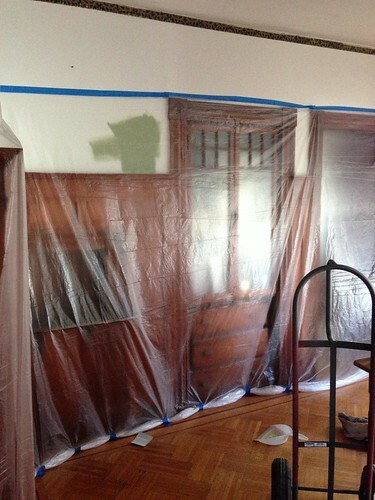 It looked like a Dexter room! 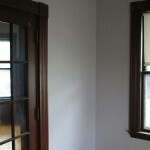 I also covered the windows and mantel in the piano room just to keep things clean. The drips of plaster come off with a damp rag but they are a bit of a neusence. We had 2 guys working on the ceilings the first day. It took the two of them all day just to hang the blue-board on the three ceilings and the smaller ceilings in the stairwell. A few days layer the main guy came back and plastered. He was awesome. He had these cool stilts that he walked around on. After all the plastering was done, we had to wait at least 3 days until we could paint the ceilings. 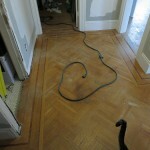 Luckily, the plastering completed on Tuesday before Thanksgiving. Unluckily, the floor guys were coming the Monday after Thanksgiving and I wanted all the ceilings painted and ready! We drove home on Saturday and got right to work. It didn’t take hardly as much time as I thought to paint all those ceilings. I started with a single coat of primer. 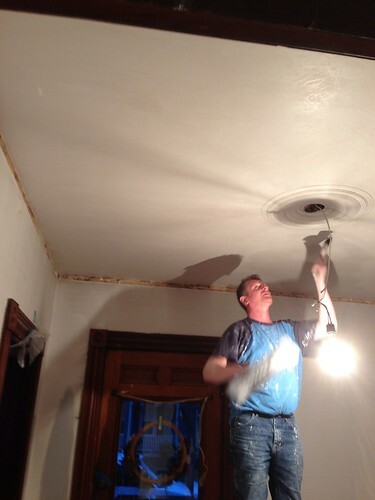 Primer is not ideal for painting ceilngs but it is necessary to seal in raw plaster. 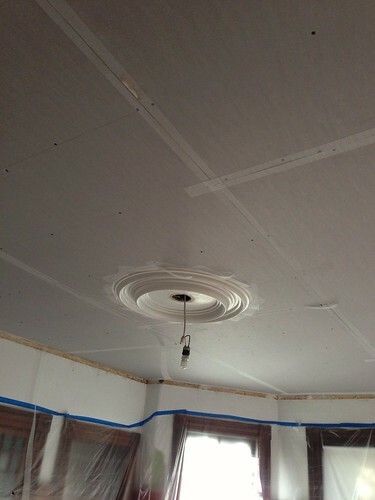 If you have raw drywall, there are special primers you are supposed to use. 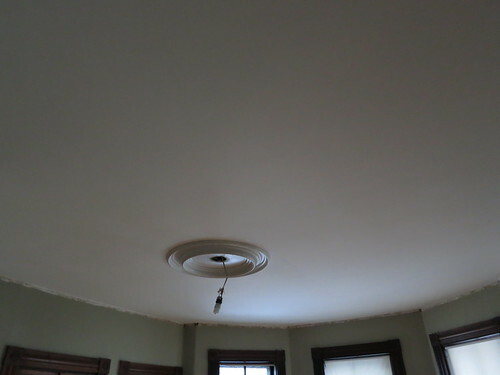 After a single coat of primer, I switched to color-change ceiling paint which is so magic it must be science. 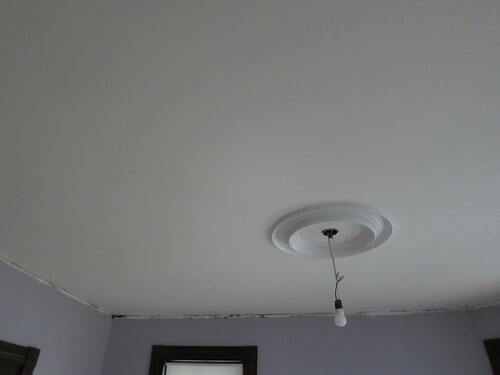 I love color-change ceiling paint and it’s sheer awesomeness makes it much more enjoyable to paint ceilings. It also makes it much easier. 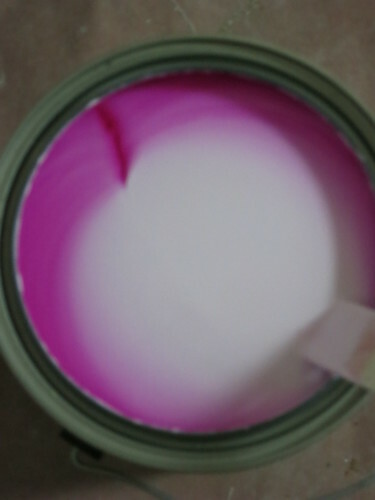 For some info about the science of color-change paint, check out the wikipedia page on phenolphthalein which I’m fairly certain is how magic ceiling paint works. Science..I’m telling you…awesome. Along with color-change ceiling paint, there are a few more things to make your life much eaiser when painting ceilings. First, get a good pole. This one is great. It is very stiff and the adjustable length is nice in most rooms and absolutely necessary in the stairwell. I also prefer a Purdy roller head. I tried a wool one and it worked quite well for a while but about 2 hours in it started to get matted and didn’t give me the nice smooth finish I was looking for. 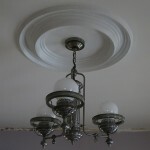 I did return to the wool roller camp when I was painting some walls later but for the ceilings, I preferred the Purdy. I also went through not one, not two, but 4 rollers. Make sure the roller you buy at the store is stiff enough and that it has good enough threads to screw onto whichever pole you’re going to use. I had 2 that wobbled on the pole, one where the metal arm started to spin freely compared to the plastic handle. I finally landed back on my orange home-depot old-faithful roller. It isn’t as stiff as I would like but it got the job done. 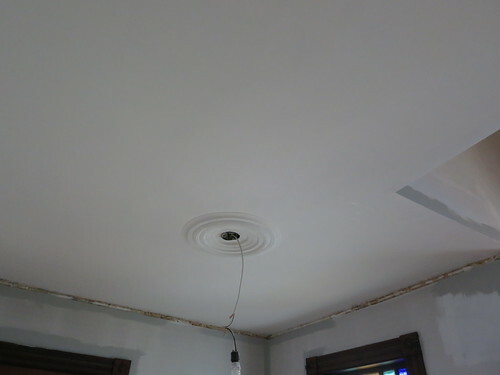 One coat of primer and 2 coats of ceiling paint and I was done! Oh, except for those cool medalions which needed to be scraped, primed, and given 2 coats by hand…with a brush. I decided a drop-cloth would be sufficient to protect the floor from that job and tabled that project for the time being. The ceilings are smooth and white and begging for molding, wall colors, and real light fixtures. All in due time I suppose. Don’t look for somebody to make that job. We find them you! Brushwork Painters does a stellar job.